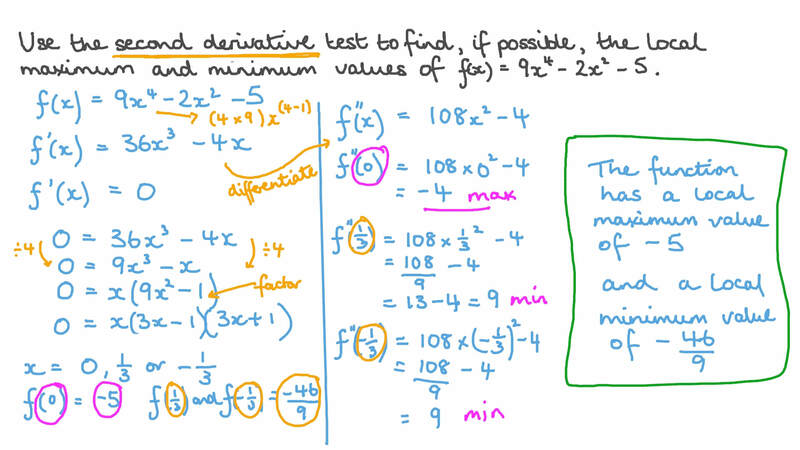 In this lesson, we will learn how to find local extrema using the second derivative test. Find, if any, the points ( 𝑥 , 𝑦 ) where 𝑦 = 𝑥 + 3 𝑥 − 1 6 3 2 has a local maximum or local minimum. A ( − 2 , − 1 2 ) is the local maximum point, and ( 0 , − 1 6 ) is the local minimum point. B ( − 2 , − 1 2 ) is the local minimum point, and the function does not have a local maximum point. C ( − 2 , − 1 2 ) is the local minimum point, and ( 0 , − 1 6 ) is the local maximum point. D ( 0 , − 1 6 ) is the local minimum point, and the function does not have a local maximum point. E ( − 2 , − 1 2 ) is the local maximum point, and the function does not have a local minimum point. Find, if any, the point ( 𝑥 , 𝑦 ) where 𝑦 = − 𝑥 + 4 𝑥 − 6 2 has a local maximum or local minimum. A ( 2 , − 2 ) is a local maximum point. BThe function does not have local maximum or minimum points. C ( 2 , − 2 ) is a local minimum point. D ( − 2 , − 1 8 ) is a local minimum point. E ( − 2 , − 1 8 ) is a local maximum point. Find the local maxima/minima of the function 𝑓 ( 𝑥 ) = 3 𝑥 − 2 𝑥 4 3 . A  1 2 , − 1 1 6  is a local minimum point. 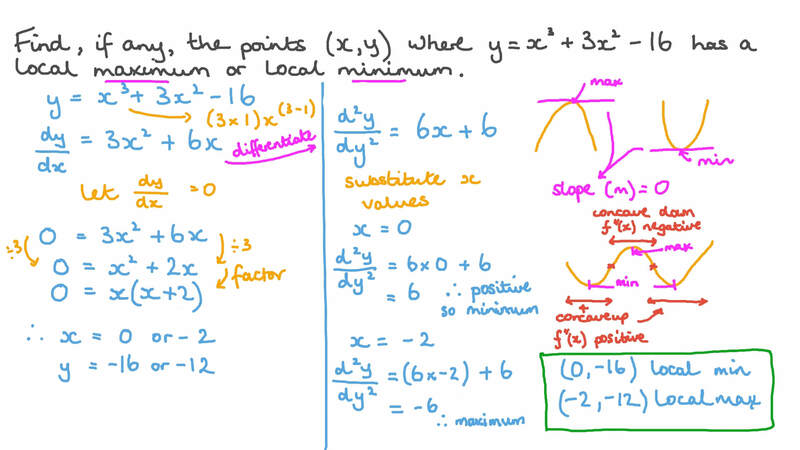 B The function does not have local maximum or minimum points. C  1 2 , − 1 1 6  is a local maximum point. D  − 1 2 , 7 1 6  is a local maximum point. E  − 1 2 , 7 1 6  is a local minimum point. Use the second derivative test to find, if possible, the local maximum and minimum values of 𝑓 ( 𝑥 ) = 9 𝑥 − 2 𝑥 − 5 4 2 . 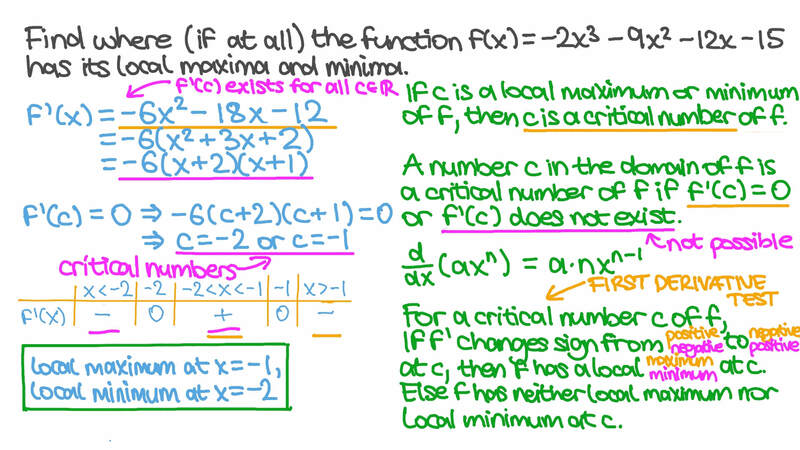 Determine the local maximum and minimum values of the function 𝑦 = − 3 𝑥 − 6 𝑥 − 4 2 . B It has no local maximum or minimum values. Determine the local maximum and local minimum values of 𝑓 ( 𝑥 ) = 4 𝑥 − 1 2 𝑥 − 5 3 . Find where (if at all) the function 𝑓 ( 𝑥 ) = − 2 𝑥 − 9 𝑥 − 1 2 𝑥 − 1 5 3 2 has its local maxima and minima. Find the local maximum and minimum values of the curve that passes through the point ( − 1 , 7 ) where the gradient of the tangent is 6  𝑥 + 4 𝑥 + 3  2 . AThe local maximum value is 15, and the local minimum value is 7. BThe local maximum value is − 5 , and the local minimum value is − 1 3 . CThe local maximum value is 7, and the local minimum value is 15. DThe local maximum value is 7, and the local minimum value is − 1 . Find the points ( 𝑥 , 𝑦 ) where 𝑦 = 9 𝑥 + 9 𝑥 has a local maximum or a local minimum. A ( 1 , 1 8 ) is a local minimum point, and ( − 1 , − 1 8 ) is a local maximum point. BThe function doesn’t have local maximum or minimum points. C ( 1 , 1 8 ) is a local maximum point, and ( − 1 , − 1 8 ) is a local minimum point. D ( − 1 , − 1 8 ) is a local maximum point. E ( 1 , 1 8 ) is a local minimum point. Find, if any, the local maximum and local minimum values of 𝑓 ( 𝑥 ) = 1 9 𝑥 + 1 5 𝑥 s i n c o s , together with their type. Find, if any, the local maximum and local minimum values of 𝑦 = 7 𝑥 + 7 𝑥 . A The local minimum value is 1 4 , and the local maximum value is − 1 4 . C The local maximum value is 1 4 , and the local minimum value is − 1 4 . D The local maximum value is − 1 4 . E The local minimum value is 1 4 . Find the local maxima and local minima of 𝑓 ( 𝑥 ) = − 5 𝑥 3 + 2 𝑥 − 1 6 𝑥 2 l n , if any. Find the local maximum and minimum values of 𝑓 ( 𝑥 ) = 2 √ 𝑥 − 4 √ 𝑥 4 .